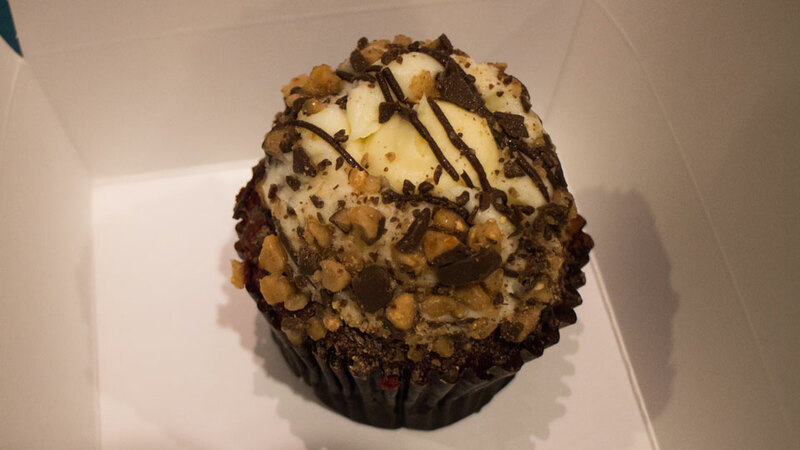 Get sandwiches, coffee, and one of Disney World's best cupcakes at Starring Rolls Cafe. Located on Sunset Boulevard in Disney’s Hollywood Studios, Starring Rolls Cafe is a great place to grab a quick breakfast or lunch in between enjoying the many attractions and shows at DHS. Starring Rolls Cafe offers a black forest ham sandwich, a turkey focaccia, and a veggie pita for those looking for a light meal. You can also grab a coffee, juice, or wine to accompany your meal. However, the stars of the show here are the baked goods and desserts that are prominently showcased in this quick service restaurant’s display case. The Red Velvet Cupcake is absolutely to die for, and it’s one of our top desserts at Walt Disney World. In fact, it may be one of the best cupcakes we’ve ever had period. Starring Rolls Cafe also serves Chocolate Peanut Butter Cupcakes, Eclairs, and Strawberry Parfaits. Starring Rolls Cafe is only open for breakfast and lunch. The restaurant closes around 4PM daily. Note: Menus for Disney World restaurants change on a somewhat regular basis, so the menu listed above is subject to change. For the most up to date menu, check out Disney’s official Starring Rolls Cafe menu.